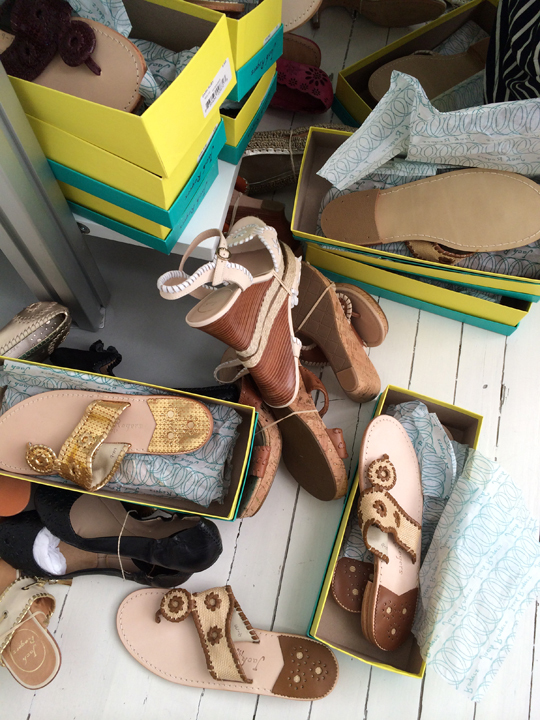 If last week's Calypso sample sale didn't quite float your boat when it came to grabbing the perfect summer beach look, maybe you'll hit the jackpot at this week's Jack Rogers sample sale. 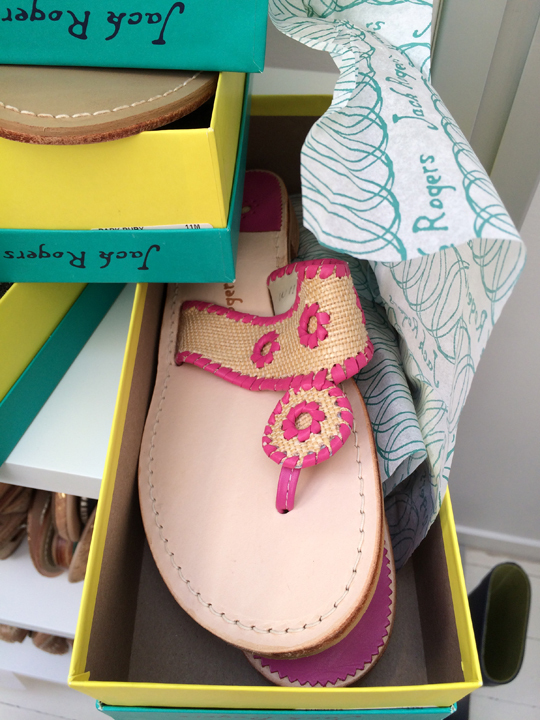 Jack Rogers' iconic Navajo sandals were Jackie Kennedy's favorite island chic footwear in the 60s and are an essential part of summer dressing even today. 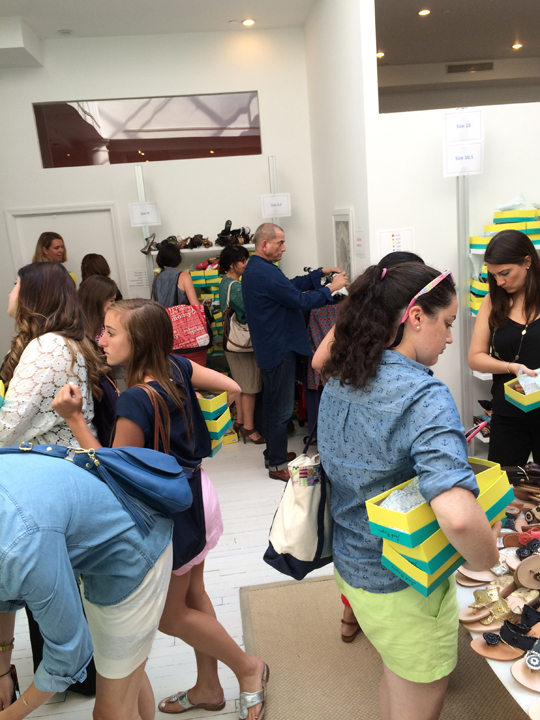 I stopped by the label's summer bargain blowout, which kicked off in the Flatiron District this morning, to see what was what. So, did Jack's pot of goodies offer shoppers the jackpot? Let's have a look! 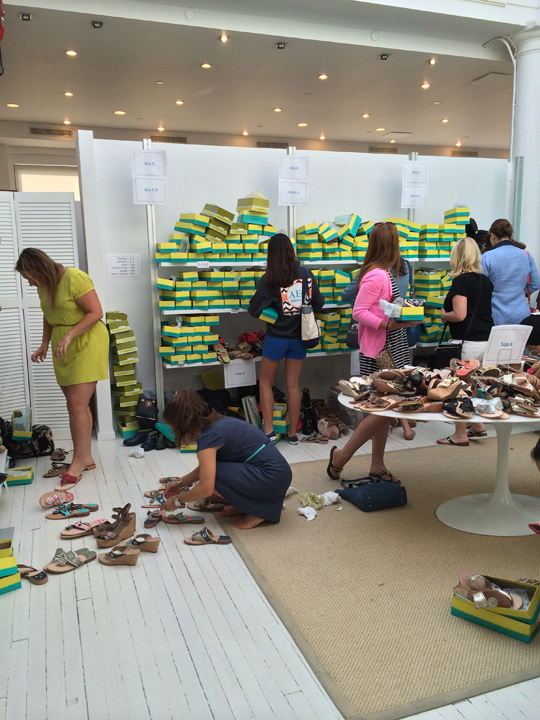 The opening of this week's Jack Rogers sample sale started at 8:30am today. 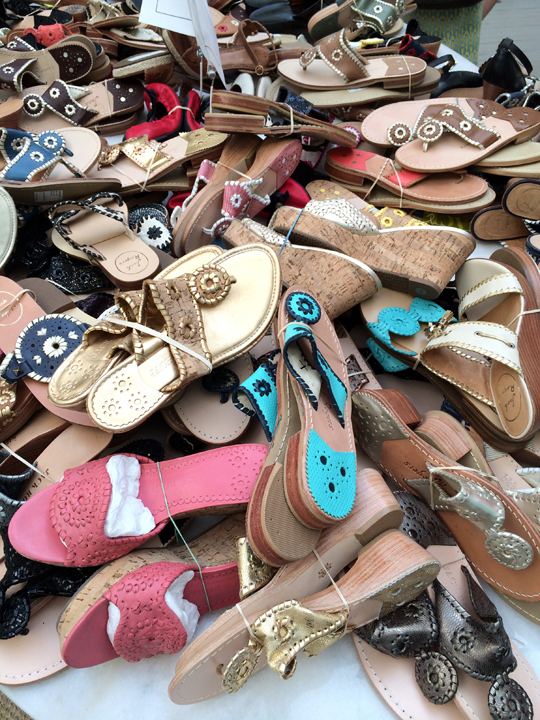 When I arrived at the company's showroom, despite the fact that many New Yorkers were suffering from Monday morning blues, I was surprised to find a large group of diligent early bird shoppers perusing the generous selection of shoes and sandals. 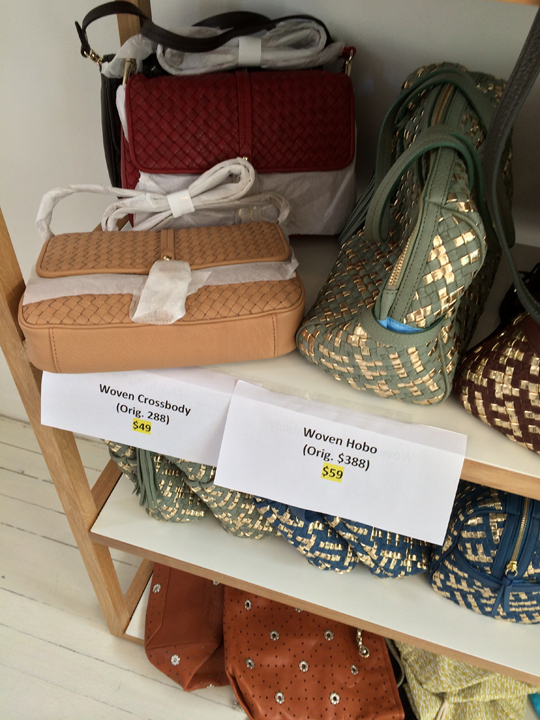 Sizes were available from 5 to 11, but 6 was the lucky number. 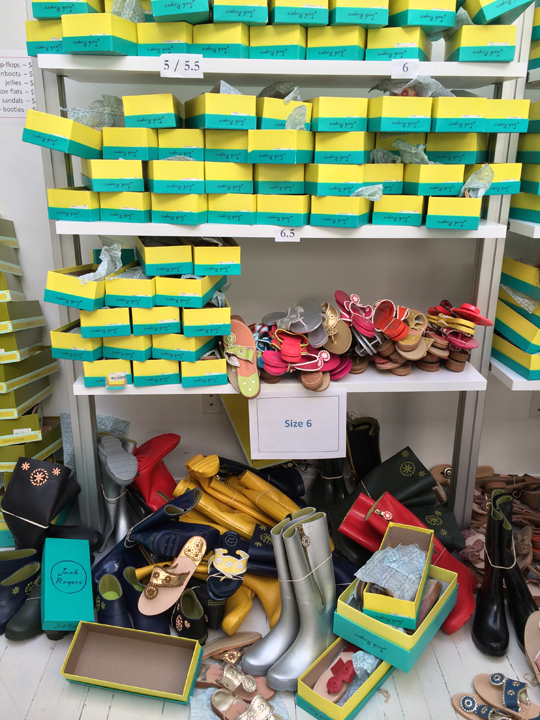 Like a pile of golden treasure, size 6 completely dominated the sale with boxes upon boxes of footwear stacked on a giant center table and against several walls. 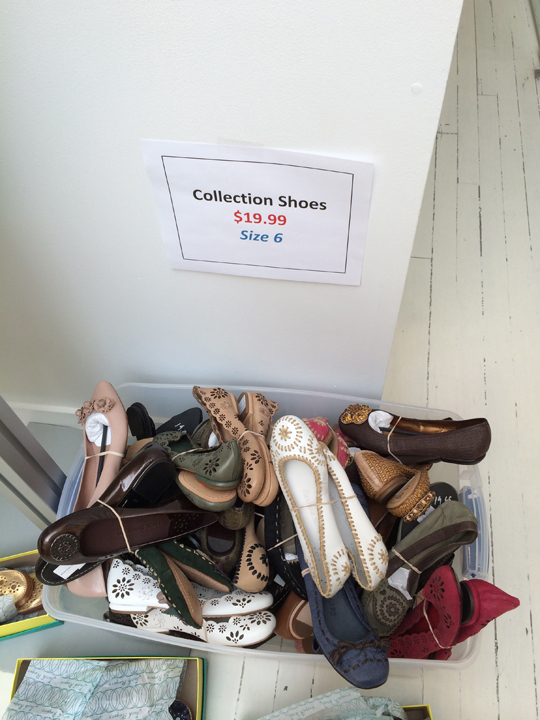 There was even one plastic box on the floor that carried Collection shoes in only size 6 for $19.99. 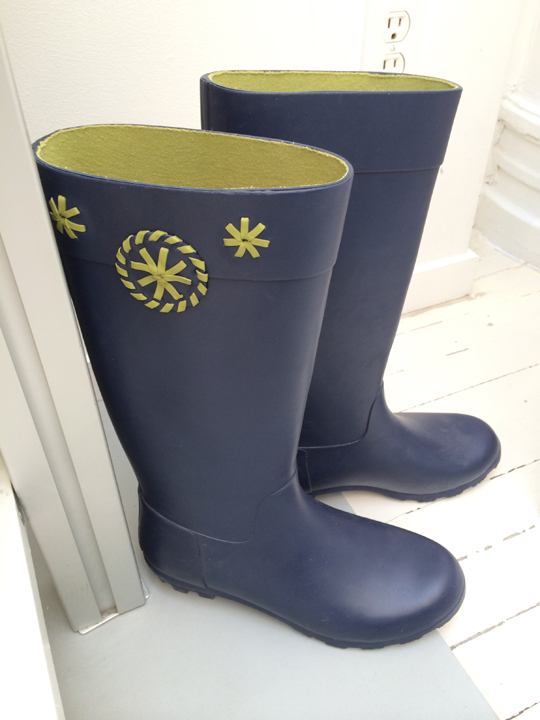 On inspecting the prices, I found flip-flops for $9, rain boots for $9, jellies for $19, flats for $29, sandals for $49, and boots/booties for $49. 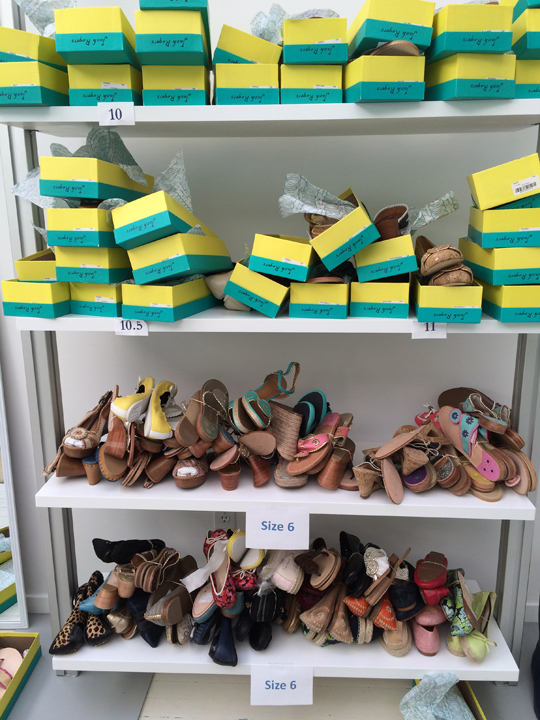 The only shoes that were priced in the three-figures were suede boots at $199. 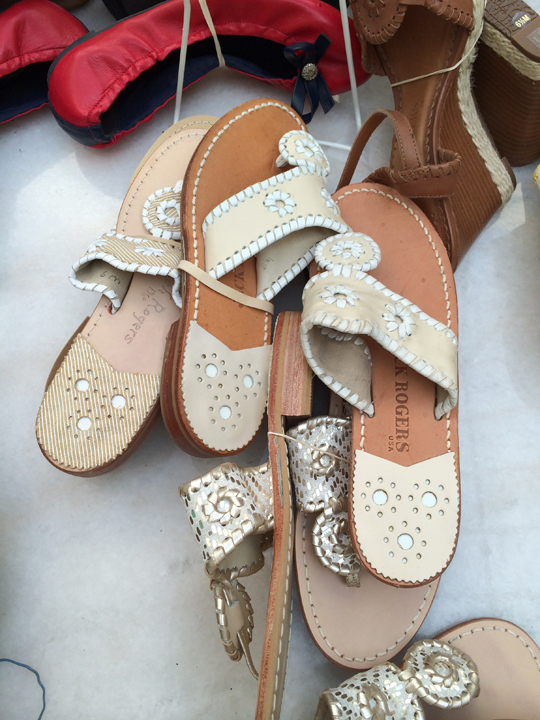 In addition to discounted Jack Rogers footwear, there were also markdown women's clothing and accessories organized on racks and in bargain bins. Let's start with the racks. I found 4 racks of clothes: one was dedicated to jackets and blazers while the other three held dresses. 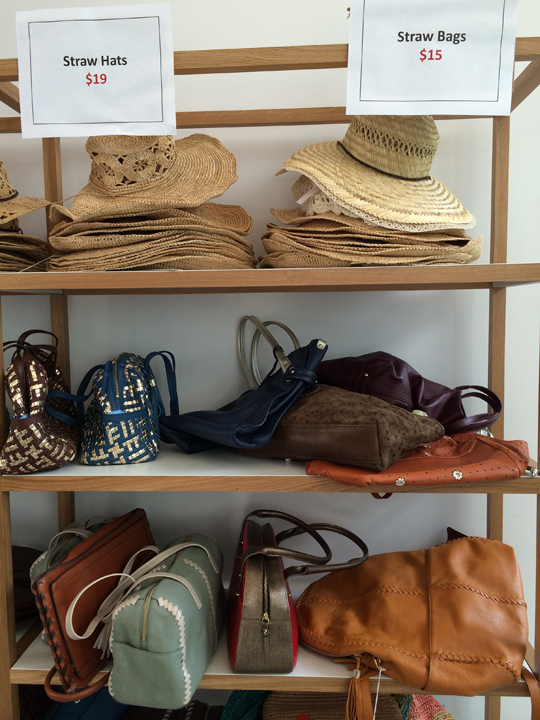 The single outerwear rack held sizes ranging between 4 and 12 while the three dress racks held sizes from 0 to 12. Prices were indicated by stickers. 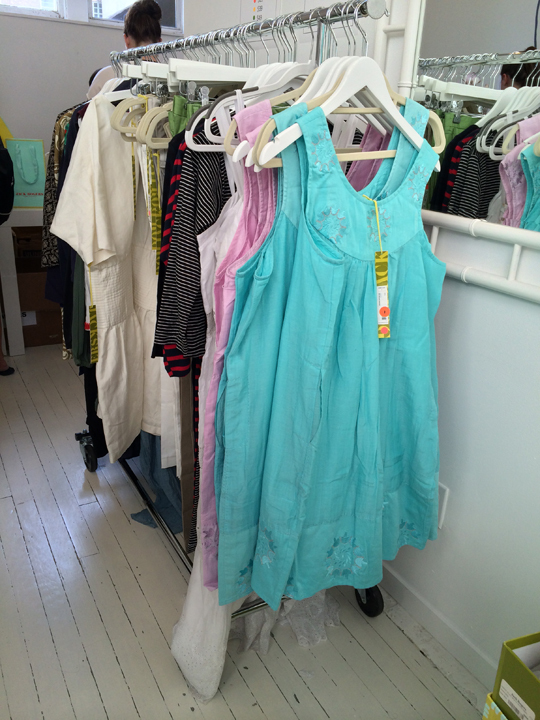 Summery frocks were anywhere between $39 to $59 while jackets/blazers were $49. 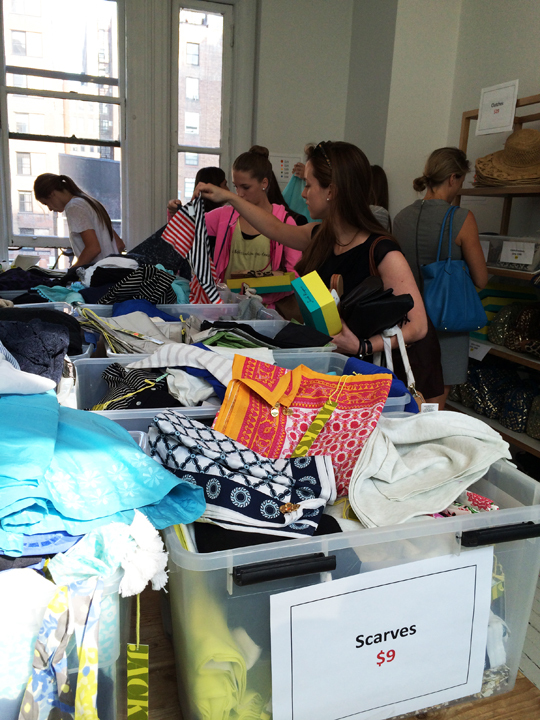 Now, moving onto bargain bins. 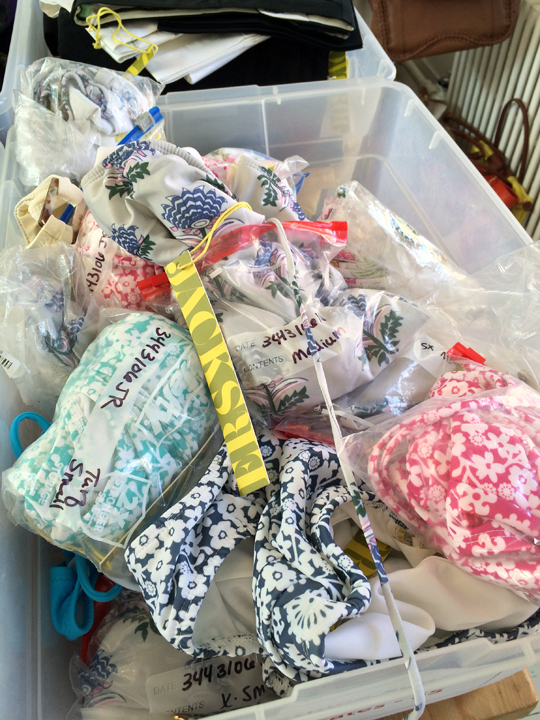 In a separate smaller room dedicated entirely to bargain bins, I found sarongs for $9, knits for $19, shorts for $29, blouses for $19, bathing suits for $10, dresses for $5, pants for $29, sweaters for $19, skirts for $29, and scarves for $9. 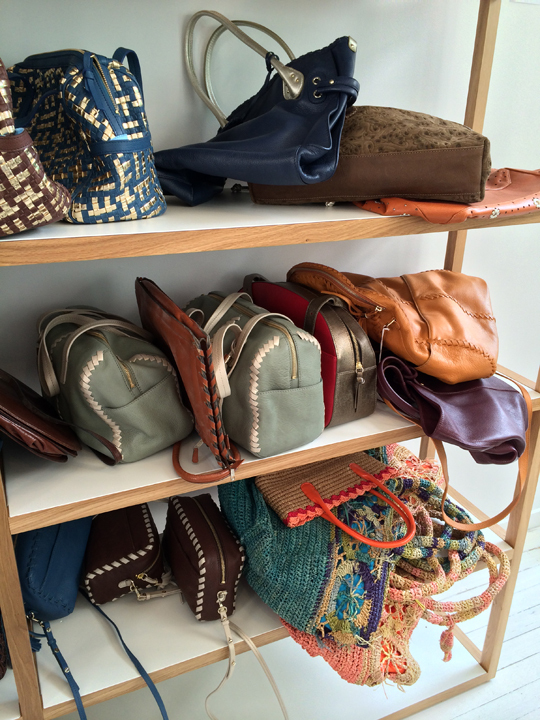 Furthermore, a standing shelf held $19 leather bags, $29 clutches, $59 woven hobos, $49 woven crossbody bags, $15 straw bags, and $19 straw hats. 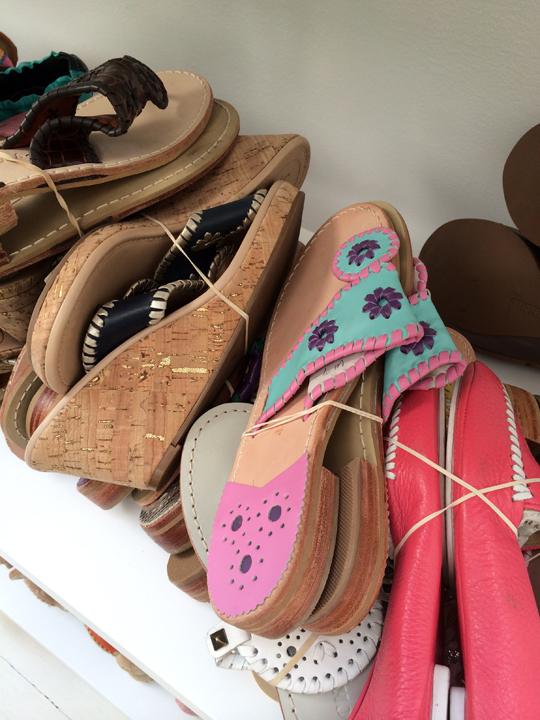 As you can see, if you're still in the market for beachy outfits, this week's Jack Rogers sample sale is worth dropping by (especially for size 6ers). With these amazing prices, you'll come out feeling like you hit the jackpot. Just make sure to check it out before Thursday 8pm. I haven't heard anything yet but I will make sure to let you know if they reduce prices. I haven't heard anything yet. I'll let you know via an article. Do they have a website? thanks! !